Burma, which is officially known as the "Union of Myanmar" is the largest country of Southeast Asia, and borders Bangladesh, China, India, and Thailand, as well as a long coastline along the Bay of Bengal in the Indian Ocean. Burmese cuisine tends to be heavily influenced by that of its neighbors. It includes dishes inspired by Chinese cuisine and Indian cuisine, as well dishes created with Burma. Halawa - Based on Indian cuisine's halwa, this dish is made from sticky rice, coconut milk and butter. Meeshei - Rice noodles with chicken or pork, bean sprouts, and rice flour fritters. Soy sauce, chili, coriander, garlic and other spices, as well as crispy fried onions, are used to garnish the dish. Mohinga - Rice vermicelli in frish borth with onions and banana-stem. It is flavored with garlic, ginger and lemon grass, and is served with boiled eggs, fried fish cake (nga hpe) and fritters (akyaw). Mohinga is considered by many to be the national dish of Burma. Pao-see - Steamed buns containing egg, pork or sweet bean paste. They are the Burmese version of Chinese cuisine's bao. Samusa - The Burmese version of Indian cuisine's samosa. It usually contains mutton and onions, and is served with green chilis, lime and mint. Si gyet hkauk swe - Flat wheat noodles with duck or pork, garlic, spring onions and soy sauce. Thingyan rice - Rice with mango salad. You are going to discover the secret family treasured traditional Burmese Recipes for the land of the Golden Pagodas in this Burmese cookbook. Myanmar (Burma) is now becoming a favourite place to visit and experience the food of the region and you are going to discover Burmese cooking. Burmese cuisine includes dishes from various regions of the Southeast Asian country of Burma (now officially known as Myanmar). Owing to the geographic location of Myanmar, Burmese Myanmar cuisine has been influenced by China, India and Thailand. The diversity of Myanmar's cuisine has also been contributed to by the myriad of local ethnic minorities. Burmese Myanmar food is characterized by extensive use of fish products like fish sauce and ngapi (fermented seafood). 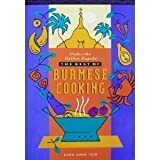 In this Burmese Cooking book you will discover Burmese Curry recipes where seafood is a common ingredient in coastal cities such as Sittwe, Kyaukpyu, Mawlamyaing (formerly Moulmein), Mergui (Myeik) and Dawei, while meat and poultry are more commonly used in landlocked cities like Mandalay. Freshwater fish and shrimp have been incorporated into Burmese Dishes recipes where inland cooking as a primary source of protein and are used in a variety of ways, fresh, salted whole or filleted, salted and dried, made into a salty paste, or fermented sour and pressed. Burmese cuisine recipes also includes a variety of salads (a thoke), centered on one major ingredient, ranging from starches like rice, wheat and Burmese Food recipes noodles, rice noodles, glass noodles and vermicelli, to potato, ginger, tomato, kaffir lime, lahpet (pickled tea leaves), and ngapi (fish paste). These salads have always been popular as Burmese Myanmar foods in Burmese cities. The 15 Secret Family Treasured Traditional Burmese Recipes is going to delight your taste buds as you cook the recipes. This book will show you the fastest way to enjoy the Burmese Myanmar cuisine. A lavishly photographed cookbook and historic travelogue, tracing contemporary and colonial Burmese dishes over the past century. With its rich traditions of empire, The Burma Cookbook highlights the best of present-day Myanmar, including foods of its immigrant populations - from the subcontinent, down the Malay peninsula, and Britain itself. The authors spent some ten years researching the book, while organizing and hosting culinary tours to uncover the country's most popular dishes. The authors had exclusive access to The Strand Hotel's collection of historic menus, pictures and photos, while contemporary photography by Morrison Polkinghorne portrays Myanmar street life. This is a book about the wonderfully rich and vibrant cuisine of Myanmar. Myanmar has recently opened up to the world but very little is known about its cuisine. Although the country is situated between China, Bangladesh, India and Thailand, its cuisine is subtly different but yet has influences from all those countries. The recipes in my book are written for both beginners and experienced cooks alike with clear instructions. The book provides measurements in metric system and recipes are easy to follow. My Cookbook Part 1 and 2 are one of those rare books with recipes on much-loved Myanmar cuisine. They will give you great happiness and enjoyment among families and friends for years to come. Mingalabar! Hello and a warm welcome to Burma. My name is Markus Burman and I am excited to share with you authentic Burmese recipes. I am living and working since more than 25 years in this country. I was already here when tanks were rolling on the streets, shots were fired, demonstrators and journalists killed and peaceful demonstrations crushed with brutal force. There is hardly a foreigner here who has been living permanently in Burma, since 1989 also called Myanmar, longer than I do. This has made me an authority on the subject of Burma what includes the Burmese kitchen. That's why I have written this Burmese Cookbook. I may not get Michelin stars and not get into the Michelin Guide because I have no restaurant, I may also not succeed in convincing Paul Bocuse that he has to put at least one of my dishes on his menu (well, I did not yet try) and Burmese cuisine certainly isn't exactly what can be called nouvelle cuisine but I know that the recipes in this book will put you in a position to create wonderful, exotic meals. Have a lot of fun with cooking Markus Burman's recipes and enjoy your meals alone, with family or in the company of good friends. It will in any case be a success story and people will love you even more. OK, let's turn our attention to this book. No doubt, it is a terrific Burmese cookbook but I am convinced that recipes alone do not make a really interesting cookbook. It needs some additional information (historical and otherwise) to - in a manner of saying - add some spices to them. In other words, in order to better 'understand' and appreciate what you are cooking and eating it is necessary to have some background knowledge. So, here comes some history of Burmese cooking, Burmese dishes and their origins as well as Burmese eating habits. At first glance it seems to be clear what Burmese cuisine is; it is that what Burmese people are cooking and eating. But taking a closer look reveals that things are not quite as clear as they seem to be. Burma is in many aspects a land of great diversity. There are many different ethnic groups such as the Mon, Shan, Kachin, Chin, Karen, Rakhine, Bamar, etc. And as diverse as the country's ethnicity is its cuisine. In other words, 'Burmese (Myanmar)' cuisine is just a catch-all term. What is called 'Burmese' cuisine is actually the sum total of the many different local (regional) cuisines and the cuisines of the bordering countries Bangladesh, India, China, Laos and Thailand for ethnic groups and their cuisines do not know clear cut and in historical terms relatively recently by humans more or less arbitrary drawn borders. Depending on what kinds of agricultural produce are available, as well as what local and regional flora and fauna have to offer many dishes with the same name are different in taste. Is it a coastal region, is the natural environment mountainous or flat, are there rivers, is it dry and arid or marshy and wet, is it hot, is it temperate, is it cold, is the ground sandy or rocky, what is the quality of the soil, how much water for irrigation is available? These and many other things about which I will tell you in this book are determining factors for what the respective local cuisine has to offer and how it tastes. Well-known writer and food historian Copeland Marks again uses his unique talent for making exotic cuisines available to the home cook in The Burmese Kitchen, the first cookbook to examine the delicious cuisine and culture of this Central Asian country. Tracing its roots back some 2,500 years, Burmese cuisine results from a mixture of religious, tribal, and ethnic influences that produces delightfully varied dishes guaranteed to please even the most jaded palate. The recipes are diverse and reflect Burma’s regional differences. A bacon stew with mild sour flavorings show the Chinese influence from the north, while coconut spiced fish served in envelopes of cabbage points out Burma’s large and bountiful coastline. An especially interesting soup involving toasted rice and pork boiled in spices and shrimp flavoring is the invention of a tribe on the Thailand border. The cuisine of this fascinating, often-ignored nation emphasizes a dazzling array of ingredients and culinary techniques which will win praise for any cook.